He stands, back to the wind, smoking the last cigarette of the day. There can be no more because there is no more tobacco. The horses are restless and he must move soon. The land is really still too muddy for ploughing, but this is what he has been ordered to do and he must therefore carry on with the stoical indifference to results that he has cultivated over the years. If this was his land – but there’s no point in going there. Or maybe? His wife has been angry with him for listening to the rumours that have begun to filter through even to this remote spot. She gave up hoping for anything when their third child died in the last hunger winter, but for him the faintest flicker remains. 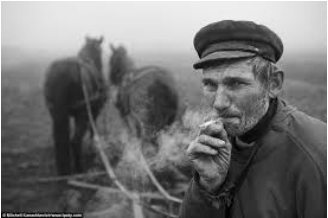 He pinches the cigarette, leaving some for later after all, and picks up the reins. There has been talk of a meeting in the next village. If he could finish in time maybe he could go and find out what is afoot. Or, as he trudges through the mud in the wake of the plough, maybe not. He is tired: weary of the endless labour, weary of not counting for anything, weary of the grief in his wife’s face, weary of this life. He gathers himself. He must force himself to go. He is not alone in making the trek – along the way others pass him. There are even one or two women in their ranks. His wife had sighed when he told her of his plans, but she no longer has the energy to oppose him. Everyone plods along, collars turned up and hats pulled down, serving both as protection against the bitter wind and against the fear of being recognised by someone who might pass their name to the bosses. The church doors are open and light blazes out over the rough square at the centre of the village. His life has been so confined that he has never been here before but although the church is somewhat larger and there are a few more houses there is very little difference from his own place. The same air of poverty and desperation is self-evident. At the entrance to the church he hesitates. Religion has had nothing to offer him for years. There had been no help as child after child had succumbed to illness. Tithes had been demanded when even that small amount of money might have provided enough food and warmth to keep just one of them alive. He cannot turn back now though. The church is packed and the speech making has already begun. As he listens he begins to look around him. He feels others do the same. How many of them are here? How many of them who had spent whole lives obeying orders, owning nothing, starving in the midst of plenty? On their own they are insignificant, but together? Not just these few villages, but as the speaker tells them more and more throughout the country are feeling the same dissatisfaction and beginning to realise their potential power. Somewhere up near the altar there are shouts, reminding them that Jesus had protected the poor and the underdogs. A banner is raised and a wild haired priest blesses it and the entire gathering. Together they surge out into the village square. Somebody grabs the banner and uses his knife to cut it into small pieces so that everyone may have a reminder of the night’s happenings. He makes his way home in silence but something has awakened. He rubs the tiny bit of material between his thumb and forefinger, a talisman, red as the blood that must be spilled, but a promise of tomorrow’s freedom.